Do not press the big red button! It’s true. They don’t want you to press the bug red button. For real, they’re not kdding. 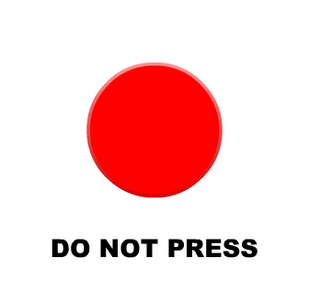 But if you need to find out for yourself, you can press the big red button here. This entry was written by FD, posted on October 21, 2006 at 1:01 pm, filed under Fun Distractions, Uncategorized and tagged Fun & Games. Bookmark the permalink. Follow any comments here with the RSS feed for this post. Post a comment or leave a trackback: Trackback URL.